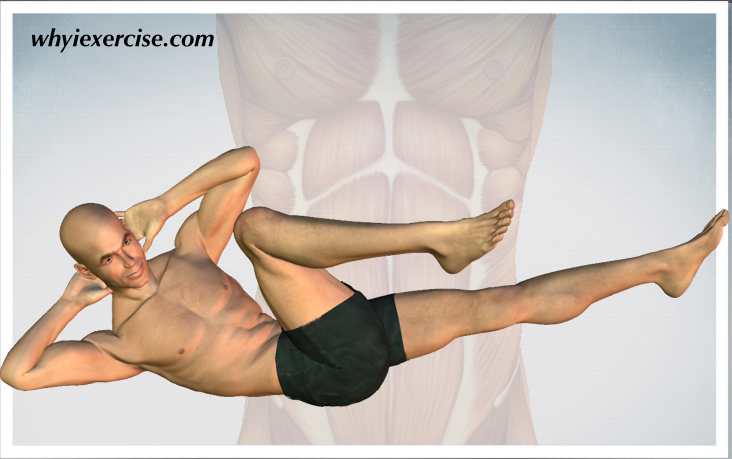 Pilates sample exercises: Videos and illustrated exercises! Core and back exercises. An intermediate level routine. These Pilates sample exercises will help you see what makes this type of exercise so popular. Pilates is a focused method of exercise that teaches students to control their breath and body movements as they train their core muscles. I selected several of my favorite Pilates mat exercises and modified them just a bit from the classic version for this routine. See the instructions and videos below. *The videos for The 100 and Bridging start with the introductory version of the exercise (from my article, back strengthening exercises). After that, the videos continue on to show the exercises as described in this article. Extend your L leg out as you pull your R knee toward your chest. At the same time, perform a crunch, and twist your body so your L elbow reaches for your R knee. Repeat on the opposite side, exhaling through pursed lips each time you twist. Keep your chest open and your elbows pointing outward, so that the movement is in your torso rather than your arms. Keep your abs firm so that your lower back remains flat on the floor. Repeat 20-30 times to each side. My complete guide to core exercise is now available! Reprogram your core muscles and work your way through 6 levels of training (beginner to advanced)! 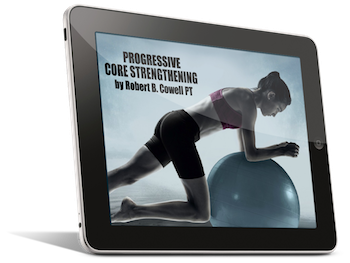 Order my new e-book, Progressive Core Strengthening. With your arms overhead, reach your hands and feet away from each other until your arms and legs and head are all in the air. Hold this position 5 seconds. Keep your shoulders down, away from your ears, and hold your abdominals tight. After a deep inhale, begin pulsing your arms and legs (left, right, left, right....) about 2 times per second. Keep your elbows and knees straight, and your arms and legs in the air throughout the exercise. After 20 pulses, hold still in the air for 5 seconds, then repeat 20 more pulses. Try to keep your body long and straight throughout the exercise. Swimming offers training for the trapezius, lumbar and gluteal muscles, making it a must to include among the Pilates sample exercises. The 100 is the most well-known of these Pilates sample exercises. When you feel the burn in your abdominals at the end of the exercise, you'll understand... Ready to take on the challenge? Start on your back with legs in the air and knees bent 90 degrees. Reach your arms for the ceiling, inhale, then exhale and reach forward past your thighs as you curl your upper body off the floor. Extend your legs, press your thighs together and point your toes. Hold this position. Keeping your arms straight and long, begin pulsing your arms toward the floor and back up 2 times per second, holding still in the crunch position. Repeat for 60-100 pulses total. *If you have difficulty keeping your legs straight the whole time, let your knees bend and finish the exercise. Keep working at it! Knees bent and feet flat on the floor as above with your heels spaced comfortably from your bottom. Raise your bottom upward slowly until there is a straight line from your shoulders to your knees. Hold this position and stretch your R leg out. Hold 5 seconds, put the R leg back and stretch your L leg out. Start on your back with legs in the air and knees bent 90 degrees. Reach your arms for the ceiling, inhale, then exhale and reach forward past your thighs as you curl your upper body off the floor. Extend your legs, press your thighs together and point your toes. Hold this position. Next, hold your R leg up and lower your L leg close to the floor without touching the floor. Keep your knees straight and point your toes. Now switch positions. Lower your R leg and raise your L leg. Hold 2 seconds and switch again. Repeat 10-15 times with each leg. For a longer, full body workout, try combining this routine with any of 3 other workouts listed in my free home exercise programs article. Resistance band exercises and body weight exercises are upper and lower body combo routines, and my knee strengthening exercises article focuses on the hip, thigh and leg muscles. Pair any of these routines with the Pilates sample exercises above and you'll have a 25-30 minute workout. You can also try the bonus exercise below. This exercise includes a fun balance component as you hold your arms and legs in the air. Lie on your back. Reach both arms high for the ceiling. Keep your knees straight and toes pointed throughout the exercise. Inhale, then exhale and roll your spine off the floor gradually (from the upper to lower back) as you raise your legs in the air. Reach your arms forward past your thighs as far as possible. Balance in this position, hold 3-5 seconds. Slowly roll back to the starting position. **For an easier version (called Roll Up), keep your legs on the floor throughout. Reach as far forward for your toes as you are able, then reverse directions. Roll back down the spine gradually until you’re back at the start position. Roll up is the first move in the video. Challenging exercise routine emphasizing the upper body and core. Moves are adapted from Pilates and gymnastics exercises. Build strength and develop balance, control and stabilization for your torso and shoulder girdle. Exercise routine for the deep muscle layers that support the spine, including all 4 abdominal muscle groups. This is a great introduction to developing a strong, balanced midsection. Target the thigh, hip, gluteus, and calf muscles that work together to support and control the knee joint. 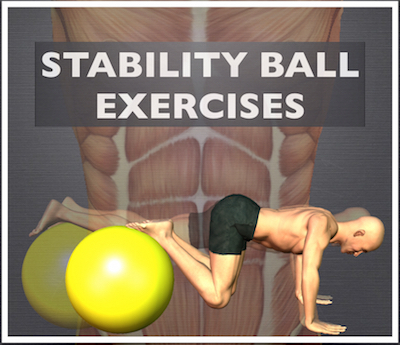 Improve your balance and muscle tone while reducing your risk of injury. 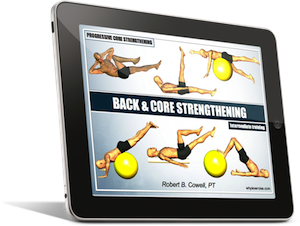 Intermediate Back & Core Strengthening In line with current research on core training and unstable surfaces, the workouts in this book incorporate the stability ball, foam roll and several movement variations for a greater challenge to the core muscles. Introductory Back & Core Strengthening Are you new to core exercise? Start with a solid foundation. 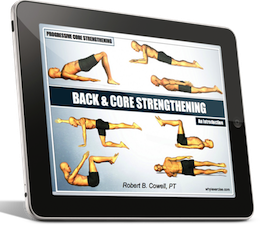 Get 8 weeks of guided training from the introductory routines in the book, Progressive Core Strengthening. 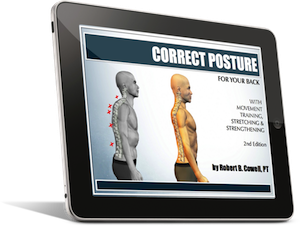 The workouts are based on rehab and fitness exercises that have helped the author's physical therapy clients for years. Return from Pilates sample exercises to free home exercise programs.